The Sistema Snack Capsule To Go is great for taking your snacks on the go, and features two compartm..
Large size with 3 layer Convenient and practical especially for outing Durable plastic. Compact a..
Warmer Can:Convenient for filling soup, especially for picnic and outing. Effectively..
5 practical compartments portioned for a childs appetite Leak-proof technology that keeps meals and..
No more messy snacks! 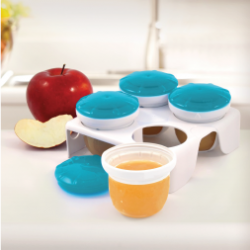 Nuby's unique Snack Keeper cup keeps kid-sized snacks inside the container ins.. Fill, freeze, snack, repeat!4 silicone storage cups that work perfectly with freshly prepared ba.. This colorful stainless steel container keeps kid-sized portions warm or cold. Store the spork, or m.. Phase 1: For The First Mounths Portions Of 25 Gr. Graduated Scale For Maximum Precision Phase 2: For.. The stainless steel Step Up Family Bottle Holder & Food Holder is ideal for using the Chicco Ste.. Divided into three sections to help pre-measure milk powder Attached small cap securely snaps o.. Designed to keep snacks in cup and off the floor Soft silicone flaps make it easy for baby to g..
Learning to eat independently was never made so easy for your child, thanks to the Nûby™ Bowl with S.. The NUK Milk Powder Dispenser offers the optimal solution to one of the daily tasks mothers face: ba.. This stainless steel kids food jar keeps meals warm or cold for your favorite student. Store the spo..
1. Spill-proof cups great for snacks and liquids at home or on-the-go 2. Twist and lock lids and cu..